A larger than life biopic for a larger than life war hero, Patton combines man and war to provide grand entertainment. 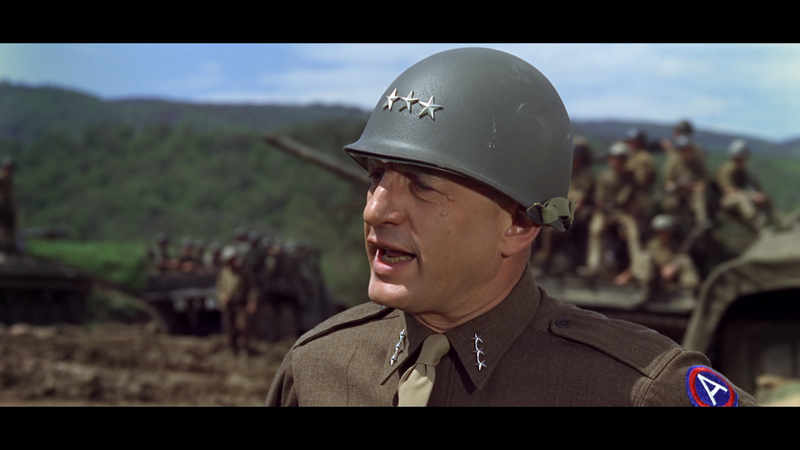 George C. Scott's inspired performance embodies both Patton's self-serving bombast and his career-limiting failings. It’s 1943, and the initial American foray into the North African theatre of World War Two is not going well: Rommel’s tanks inflict a heavy defeat on the Allies at Kasserine Pass. In response, General George S. Patton (Scott) is placed in charge of the American II Corps. Confident, aggressive and a loud mouth, Patton appoints General Omar Bradley (Karl Malden) as his second in command and adopts an all-attack, all-the-time mentality while instilling discipline and improving morale. Before long, Patton masterminds an impressive victory over Rommel at the Battle of El Guettar. Patton believes in reincarnation and destiny. He is convinced that he has lived many previous lives and participated in several key battles throughout history. It is now his destiny to play a leading role in the Allied victory over the Germans. After success in North Africa, his next objective is the invasion of Sicily, and Patton places great emphasis on personal glory. To the disgust of the more rational and cautious Bradley, Patton turns the invasion into a personal race with British Field Marshal Bernard Montgomery (Michael Bates) to reach the key port city of Messina. But Patton finally allows his passion to get the better of him: he accuses one of his soldiers of cowardice, and strikes him. The incident stalls Patton’s quest for glory, and he is forced to wait in the wings while Bradley is promoted into a key role as the Normandy invasion looms. A war movie filled with the thunder of conflict and the agony and ecstasy of the humans who wage war, Patton is an enduring cinematic achievement. Through the eyes of General Patton, humanity's deranged but passionate love of carnage is expressed. Patton was born to lead men into war: ironically, the battlefield of death is the one place he feels most alive. The movie makes no apologies and no excuses. Men like Patton turned back evil and won the war, and this is his story. Scott’s portrayal of Patton is perhaps one of the greatest acting performances in Hollywood’s history. Dominating the screen with personality, Scott fills the giant boots of a General who takes no prisoners, and accepts no nonsense from allies, superiors, or colleagues. Driven by a palpable sense of historic purpose, able to feel destiny’s touch on his broad shoulders, Scott brings Patton to life as a man bulldozing his way to the certainty of victory. But Scott also finds the self-aware tragic hero deep within Patton: an inability to control his mouth or his temper, a propensity to place personal objectives ahead of the war’s strategic needs, and an almost obsessive focus on immediate tactics as opposed to the big picture. Patton is aware of his weaknesses, but where others see a dangerous loose cannon, he remains certain that despite his failings, the final outcome will be in his favour. 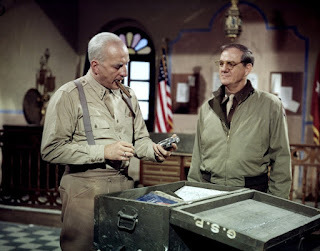 The contrast between the flamboyant Patton and more restrained Bradley, portrayed with resolve by Karl Malden, is a study in divergent leadership styles. Both are effective at what they do, but Bradley is more cerebral and careful, while Patton is driven by emotion and ego. Bradley creates fewer waves, demonstrates more empathy, and is more cognizant of the greater needs of the Allies. Patton measures success according to immediate battlefield results, and has no time for the desktop generals and their political masters. In an organization as large and complex as the US Army, it is no surprise that the "company man" Bradley climbs the career ladder ahead, and over, the more radical Patton. Written by Francis Ford Coppola and Edmund H. North, everything about Patton is large to match the enormity of the man. 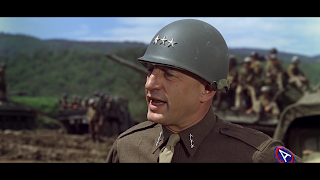 The running length is close to three hours, the opening scene speech in front of a gigantic flag is audacious, the assembled armies of men, tanks and trucks are huge, the battle scenes are impressively grand, and the personality battles between Patton, Bradley, Montgomery are no less absorbing. With director Franklin J. Schaffner finding engaging settings and interesting camera angles for almost every shot, and Jerry Goldsmith providing a rousing yet poignant soundtrack with echoes across the sweep of history, Patton is an artistic epic of legendary men eternally defined by a monumental conflict.